The easiest way to distinguish between a climbing rose and a rambling rose is their flowering habit. A climbing rose will repeat-flower almost all summer, whereas a rambling rose will only flower once. Climbing roses are not self-clinging so they need tying to some form of support. This can be a tree, trellis or a framework of horizontal wires fixed to free standing posts or a wall. If using the horizontal wire system fix eye bolts to the posts or wall and set the wires at 300mm (12") centres. Failure to prune can result in a tangled mess of branches with very few flowers. 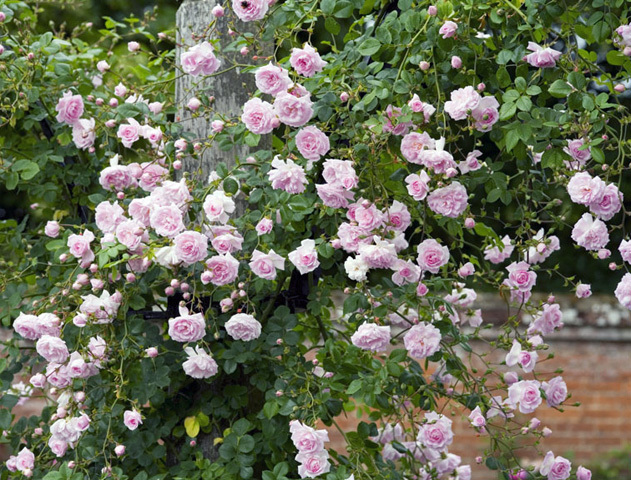 Climbing roses subject to their age may need different forms of pruning e.g.Formative ,Routine, or Renovation. This is basically the initial tying in and training of young climbing roses to their support. If using a trellis support system either twist* or tie in each of the main stems around /to the vertical laths. * This method can create problems if and when the time comes to remove the stems for any reason. With a wire support slant the main stems in a fan shape tying them in where they make contact with the wire support. In both cases where there are only a few stems on the plant, tip-prune the stems back to the first strong bud to encourage side shoots. Prune in late autumn after the flowers have faded or leave until after leaf fall. Pruning when not in leaf makes it easier to see what needs pruning, moving, tying in etc. Firstly remove any dead or diseased shoots, then prune any flowered shoots back to two thirds of their length. Finally tie in shoots as necessary onto support frame. This is the treatment for a plant/s that has been allowed to get out of hand. Remove all dead, diseased, dying and weak shoots. Cut out all but five or six old woody branches to the ground*. Tie the remaining branches into the framework. * Idealy do not leave dead stumps at the base of the plant, rain can collect here and encourage rot. If this is difficult to achieve ensure that any stumps left have been cut to leave a sloping finish to encourage rainwater to run off them. Shorten side shoots by one third to a half, to encourage branching. On completion clear away all debris. In spring as the plant sets forth new growth, fork in a general rose fetiliser and spread a 50mm (2") organic mulch around the base of the plant.